It's uncanny how much stuff seems to accumulate in your house when you have a baby. When I was pregnant with my first, Pinterest was nonexistent as were the highly detail-oriented "Must-Have's For Baby" that nearly every mommy blog on the planet boasts of. I fell victim to registering via the nondescript booklets provided for you in the welcome bags of big box baby stores and in doing so, ended up with products that were neither tried nor tested let alone reviewed honestly by my peers. Much of what I registered for with my first baby, such as our cushy, fabric covered high chair, was only good up until a certain age before it became yet another cast off in our garage or as my husband likes to call it "where baby crap goes to die." Did I mention that it was FABRIC? I was such a rookie, as if I didn't have enough laundry to do already. It's mind blowing how much of that stuff then appears to multiply right before your eyes when you go on to have three babies in four years, laundry included. Before I knew it we became the proud owners of two convertible car seats, an infant carrier, a high back booster seat and three, yes three, of those booster/infant feeding seats for the kitchen. Why? 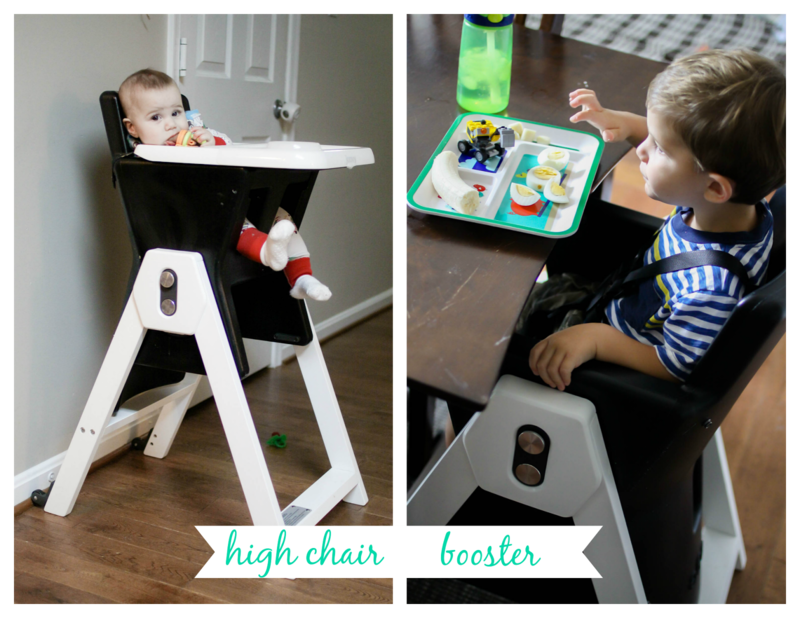 Because when my oldest outgrew the high chair, he needed a booster. 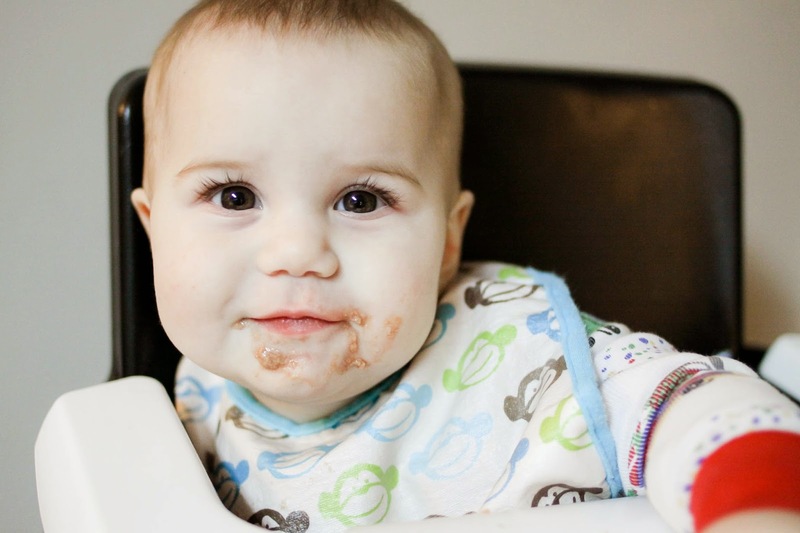 When his younger brother became the proud owner of the hand me down high chair and saw his older brother's new level of culinary freedom, he too insisted he sit in a booster as well. Sure they're called "Space Saver" seats because they can be attached to pre-existing chairs but I find that title a bit misleading as we were suddenly down two kitchen chairs. Although the space-saver seats were space-saver-ish, I couldn't push the existing kitchen chairs into the table while they were attached which meant those two chairs stuck out a good twelve inches from the table causing our already cramped kitchen even less room to move about. Not so much space-saving any more, eh! While I no longer missed the daily shuffle of moving a stand-alone high chair around my kitchen, I certainly wasn't a fan of the new developments. I found myself longing for the ease of the high chair days but I wanted a chair that could grow with my child. A chair that wouldn't need replacing in just a few short months. A chair that kept them confined as a baby but grew with them into a booster seat that also had amenities such as a safety harness and removable tray. And thus was born the Joovy HiLo, an answer to my convertible baby and child product prayers. 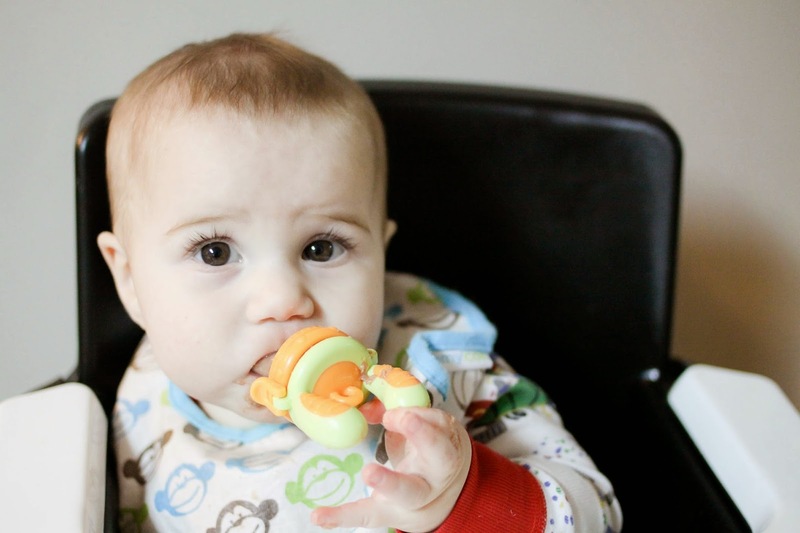 One baby product that accommodates baby from six months to six years. That features all of the bells and whistles I longed for in both a high chair and booster seat, but in one. single. seat. Talk about transition-friendly. Kids and babies are messy. MY boys are the messiest. Whether it's meal time, play time or even bath time, the size of the messes they make can only be compared to letting, say, the Tazmanian Devil loose in a china shop after a romp through a muddy field. There are two things I love most about this high chair. One is that it transitions with my youngest baby from first foods to finger foods and pretty much all the way up until he could make his own food and two is that I could take this entire chair out on my deck and hose it down when need be. Just like that, two of my biggest meal time conundrums solved. This high chair wins mega bonus points for the added 5-pt safety harness as well as the removable tray insert that is also dishwasher safe. Even though my 2 year old isn't the biggest fan of being tethered to a seat during meal times, it's imperative that his sticky hands stay where I can see them, as opposed to leaving their mark on my walls and furniture. 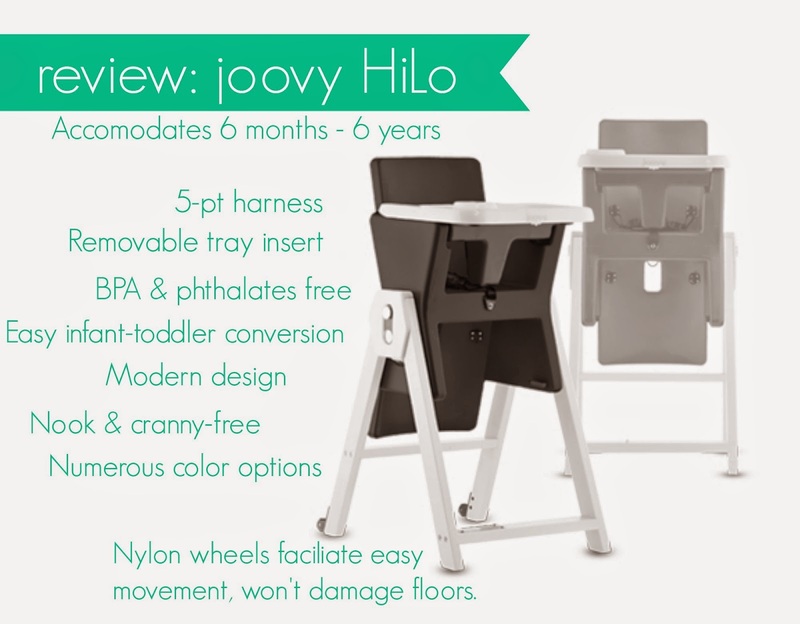 The Joovy HiLo fits perfectly in the corner of my kitchen and as needed, glides easily along my wood floors. Finally, not only can we eat dinners at the table as a family but we can invite friends and family over to dine as well, without having to play musical chairs. When my 8 month old isn't occupying it, I easily convert it to the booster option for my wiggly, messy 2 year old. Now, I know what you're thinking. With a $399.99 price point, it's a rather extravagant piece of baby equipment, especially for it being "just a high chair" (although I don't necessarily agree with that last statement). I do believe that it is on-par with other similar luxury products such as the Stokke Tripp Trapp ($299), bloom Fresco ($550) as well as the Boon Flair ($229) and thus, priced accordingly. I also believe it is worth the money because not only are you paying for two seats in one but you're paying for a quality that will last through multiple children and even multiple generations of children. While this is not a seat I would have picked up voluntarily for my third and final baby, it's most definitely a product I would have strongly considered as a first-time mother and one I will undoubtedly recommend, especially for it's convertible nature, modern appearance and ease of cleaning. This post is brought to you by Joovy. All opinions expressed are my own. I received product for free in exchange for my review- no additional compensation was received. I love joovy & this seat look cool but IMO it's $100 too high. Wow so cute baby. I want to kiss him!!! !